Bringing the Refreshing Tradition of Oshibori Hot & Cool Towels to Canada! Create a sense of trust in your valued customers by showing them that they are well taken care of. High quality, 100% North American-Made, 100% biodegradable, individually wrapped white towels. You choose whether you want heated or cooling towels! 100% cotton and 100% biodegradable. Lightly scented with natural essential oils for aromatherapy: Choose Lemon, Lavender or Unscented. 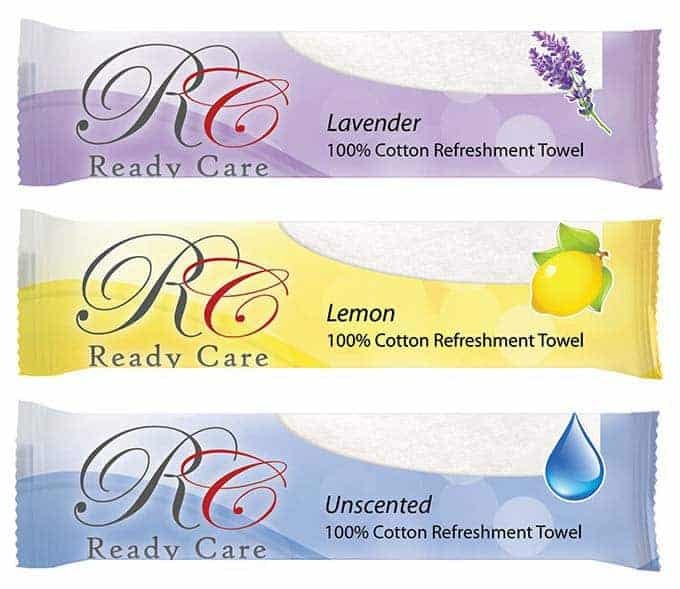 Compact, portable, pre-moistened disposable face towels, individually packaged and sealed. Easy way to clean up, relax, soothe muscles, or refresh and cool off. Can even be handed to clients on their way out the door for a lasting impression! These moist towelettes can be offered as either heated or cool. Help your customers feel pampered, taken care of, and grateful. Completely microwave safe. With a monthly subscription we will offer you a FREE towel warmer! Our products are high-quality, luxury cloths that will make a lasting impression on your clients. For some real life reviews check out our social experiment video. Order Above or Call/Email Us Today!